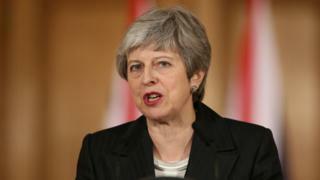 Image caption Theresa May has said letting MPs take over the Commons agenda sets an "unwelcome precedent"
A Welsh Conservative MP has said the "most ardent" Brexiteers have paved the way for a softer Brexit or no Brexit at all, after MPs voted to take control of the Parliamentary agenda. The prime minister suffered yet another defeat on Monday, by 329 votes to 302. MPs voted to set up votes to take place on Wednesday to find out what kind of Brexit has most support among MPs. Simon Hart, Carmarthen West and South Pembrokeshire MP, said the situation was "hard to fathom". Mr Hart criticised Tory MPs of the Eurosceptic European Research Group (ERG) for not backing Theresa May's deal. "Inexplicably some of the most ardent Brexiteers have now paved the way for a softer Brexit or no Brexit at all," he told BBC Wales. On Monday, Theresa May did not commit herself to abiding by the wish of the Commons, expressed in so called indicative votes by MPs. Earlier, Mrs May had told MPs she did not have enough support to win a vote on her EU withdrawal deal "as things stand". Glyn Davies, Conservative MP for Montgomeryshire, said the "decision by MPs to take over the business of government was not a surprise to me, even if I thought it a historic mistake". "And we may look back on tonight as being the moment when Brexit died," he warned. A similar view was expressed by Welsh Secretary Alun Cairns, who said Monday night's vote "may show ERG members that Brexit is more difficult than ever to achieve". "Supporting the Withdrawal Agreement is the only way Brexit can be delivered. Labour Members in leave seats will also have difficult questions to answer from their constituents." Mrs May's Withdrawal Agreement with the EU has been rejected twice by MPs, who are expected to back a legal change this week to postpone the Brexit date from the original 29 March. ERG chairman Jacob Rees-Mogg is among the group of pro-Brexit MPs who the prime minister has been trying to persuade to back her deal. On his ConservativeHome podcast, he said: "I have always thought that no deal is better than Mrs May's deal, but Mrs May's deal is better than not leaving at all." Monmouth Conservative MP David Davies urged Tory Brexiteers to back the prime minister's deal or risk "losing everything". "It's quite obvious what those of us who are committed to Brexit should do," he said. "Stick together, stop arguing with each other, take that half loaf compromise now and use it to build a better relationship with the European Union but to get out of the EU first." He said: "Take that compromise, do it now or we've lost everything." Mr Davies said the deal offered "certainty to businesses" and it respected the result of the referendum. "It's not a perfect deal, it's a compromise. I think the ERG need to accept it's a compromise and they should back it," he said. Ann Clwyd, Labour MP for Cynon Valley, said: "MPs will no longer play this game of Russian roulette-we are now in charge of Brexit. "We will now be able to spell out the deal we want. We will call the shots and do what we think is best for our constituents." Ms Clwyd Labour colleague, Gower MP Tonia Antoniazzi, urged Mrs May to "stop being so stubborn and inflexible - that is not what people voted for and she needs to work with all MPs across the house to sort this shambles out". "Parliament has changed thanks to her since 2016, so has the opinion of the country and as PM she needs to reflect that!" she added.